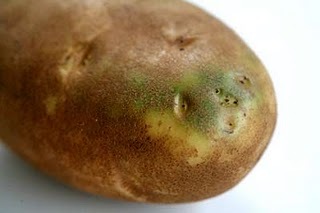 Greening is a normal colour change in the potato when it is exposed to light. It is caused when natural chlorophylls from the potato’s cell structure are drawn to the surface forming solanine. This gives a greenish colour and changes the flavour of the potato. Greening can be prevented by storing potatoes in a dark place. Often potatoes are sold in paper bags because it prevents greening while allowing proper air circulation. Plastic bags are sometimes used to allow consumers to see the potatoes they are purchasing. These are perforated to allow in air. Potatoes purchased in a plastic bag should be transferred to a heavy paper bag for longer storage.